angular cheilitis single or multiple fissures and cracks at the corner of the mouth on one side or both sides, which in advanced stages may spread to the lips and cheeks. Causes include primary or superimposed infection with microorganisms such as Candida albicans, staphylococci, or streptococci; poor hygiene; drooling of saliva; overclosure of the jaws in patients without teeth or with ill-fitting dentures; riboflavin deficiency; or other causes. Called also perlèche. inflammation and fissuring radiating from the commissures of the mouth secondary to predisposing factors such as lost vertical dimension in denture wearers, nutritional deficiencies, atopic dermatitis, or Candida albicans infection. A condition characterised by inflammation, exudation, maceration and fissuring at the angles of the lips. 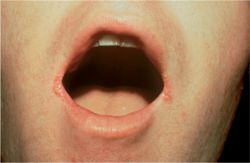 Angular cheilitis is most often linked to candidiasis, but is also related to the decreased vertical dimension of lower face in edentulous elderly with loss of alveolar bone; sagging of cheeks due to myotonia; sialorrhoea; ariboflavinosis (with glossitis, keratitis and seborrhoea-like dermatitis); malnutrition; streptococcal infection. Perlèche Dermatology A condition characterized by inflammation, exudation, maceration and fissuring at the angles of the lips Etiology AC is most often linked to candidiasis, but is also related to the ↓ vertical dimension of lower face in edentulous elderly with loss of alveolar bone, 'sagging' of cheeks due to myotonia, sialorrhea, ariboflavinosis–with glossitis, keratitis, and seborrhea-like dermatitis, malnutrition, streptococcal infection. Reddish inflammation of the lip or lips and production of fissures that radiate from the angles of the mouth. Synonym(s): angular cheilitis, angular stomatitis. Precancerous damage to the lips (primarily the lower lip) due to excessive exposure to the sun. Dermatitis of the lips resulting from chemical irritants in lipsticks, lip cream, and various other materials. Inflammation and fissuring radiating from commissures of mouth secondary to predisposing factors such as lost vertical dimension in denture wearers, nutritional deficiencies, atopic dermatitis, or Candida albicans infection. 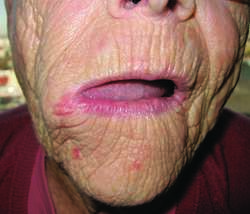 n a disease that most often occurs among the elderly but is caused by parasitic fungi, along with bacterial involvement, or a deficiency in vitamin B rather than age; angular cheilitis appears as skin lesions on the lips, particularly as breaks in the tissue at the corners of the oral cavity (commissures). Often occurs in conjunction with reduced mobility and strength in the oral cavity. See perlèche. The mucous examination showed a commissural Cheilitis and Glossitis.